Phwoar!!! I wanna go touring again! A question to Kim and Charlotte (not a criticism), why do you do your Ortliebs up like that? I pull the shoulder strap down into the clip on the side at the bottom and wonder if I'm missing something? 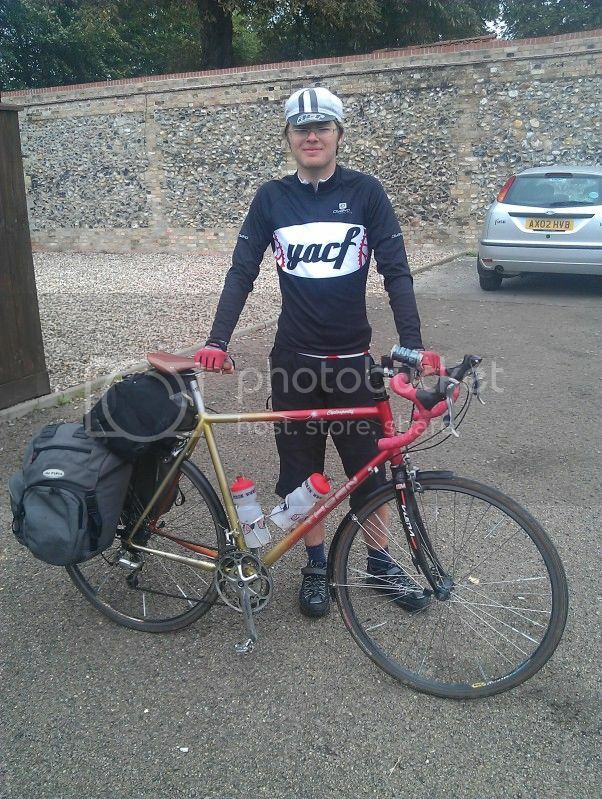 Here's one from last week's tour of East Anglia. I don't use the clip at the bottom either as they fasten OK without it - one less thing to faff around with. 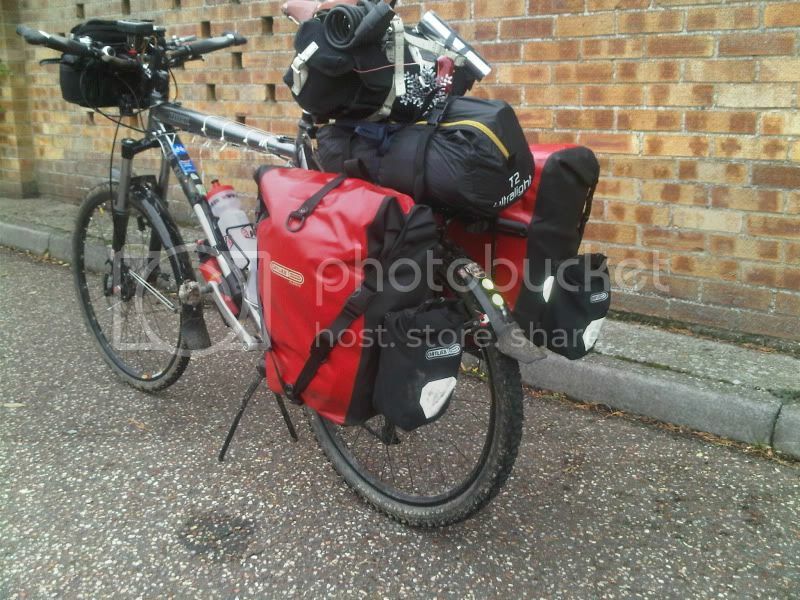 On the front panniers I keeps one strap folded inside, for use as a shoulder bag when shopping etc. Shoulder straps are pointless extra faff and weight if you're not going to be carrying the panniers around on foot (as a general rule, I have bicycles to avoid the need for carrying things around, and in a touring situation I can imagine wanting to lug at most a single front-roller around for any amount of time), so they stay at home. That just seems like the natural way to seal them for optimum waterproofing. Not entirely clear in that picture, I've got the over-the-top straps crossed over between the two back-rollers. This mainly acts as a baffle to stop the water in the bag on top of the rack from sloshing about too much, but also provides a useful temporary thing-holder and knobbles the simplicity of the quick-release for traffic-lights-in-That-London security. 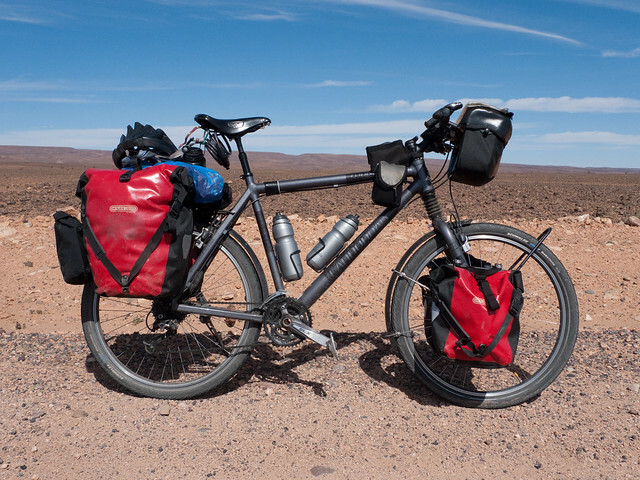 The clip at the bottom is, as far as I can determine, designed for securing a 7 Watt flexible solar panel across the rear panniers with zipcord. Also, with the uberlightweight Ortlieb bags, they're thin enough to roll up the top like a dry bag, rather than just fold down and secure with the cross-strap. Interesting. I use the clip at the bottom as I have found the should straps useful for off bike carrying. Also, by using the bottom clip you can pull the top roll down nice and tight which looks better for waterproofing plus it squeezes the contents down from the top so helps stop stuff rattling. Again, not inferring any criticism just curious. Not just the uberlightweight ones, though how well it works depends on how crammed they are. I pack to allow two folds. I thought this was the whole point in the roll-top design. Also, by using the bottom clip you can pull the top roll down nice and tight which looks better for waterproofing plus it squeezes the contents down from the top so helps stop stuff rattling. Once you've expelled the air and taken up the slack by closing in a dry bag style, the cross strap achieves the same thing. They were well full so it was tricky to get enough material to roll up. I like at least 2 rolls to guarantee watertightness. I don't think it really matters how you do it. I love Ortliebs as they really are watertight although I've not tried other brands apart from my old 1980s Karrimors which weren't remotely waterproof. See, you've closed the external pockets our way! I've only had an Ortlieb leak when I crashed and made a hole in it (and that's now fully repaired with the appropriate patches). They really are splendid. Not that I have any complaints about the cavernous Altura Orkneys in that regard - they've done equally well in the face of serious drenchings - they just fouled the rear brake on the Streetmachine. That's cos there aren't any clips or little shoulder straps. When youth hostling the shoulder straps become very useful for carting the bags from the cycle store to the dorm. 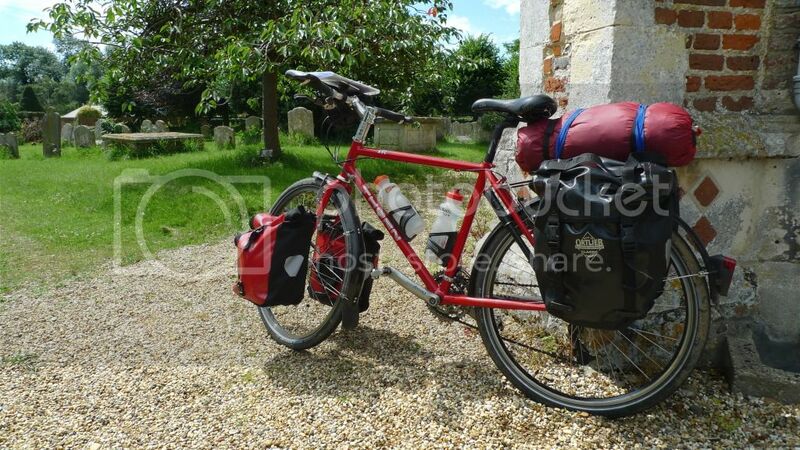 However when camping I can see they become superfluous as the bike is parked next to the tent. Or in Kims case tied to the tent by a guy line. If you're bear-sized the shoulder straps are a complete waste of time, just like the Ortlieb barbag straps. 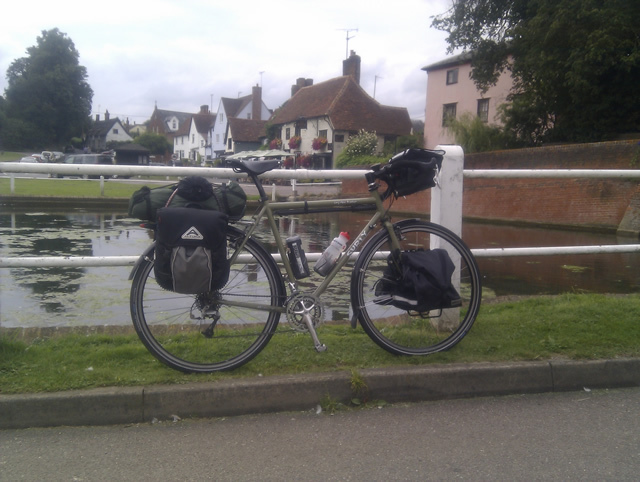 Dawes Sardar with Ortliebs, B17, Marathons, Tubus - the usual stuff. Rivendell Brand V boxybar bag and seat bag, Terra-nova laser comp on top of the rack. 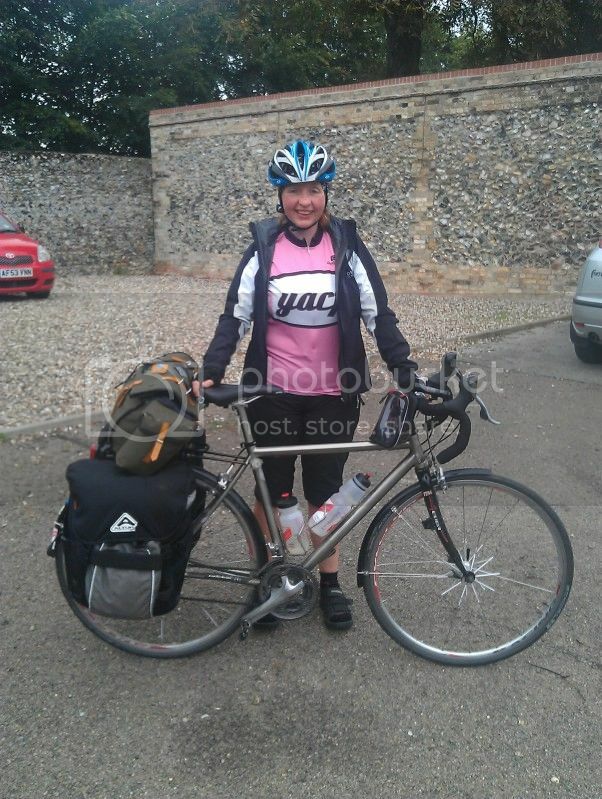 Fluffy towel hanging from the left pannier because it was still wet. 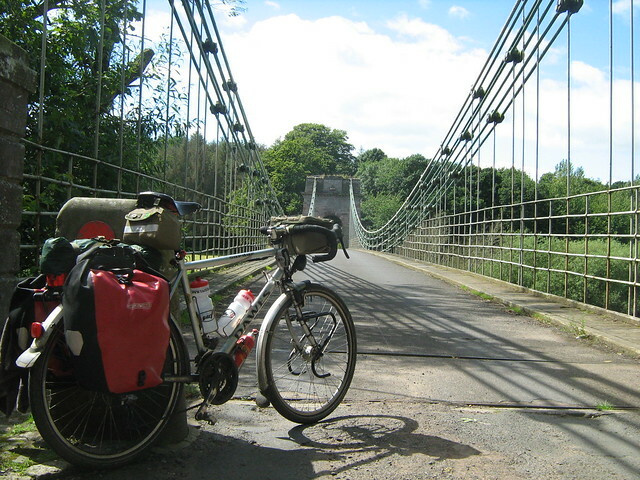 That's the Union chain bridge over the Tweed, just over halfway along the coast and castles route. This ^, I just use the tops clipped together as handles to carry my Ortliebs. If I need to carry them further (i.e. 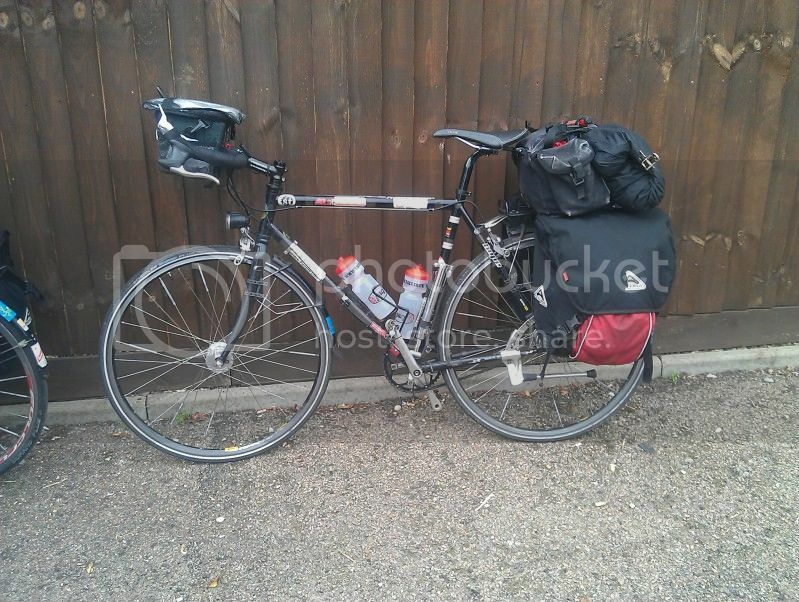 through airports etc) I have a cheap holdall which will take both panniers and the barbag. This one was taken on Dartmoor along the route of the Devon C2C. 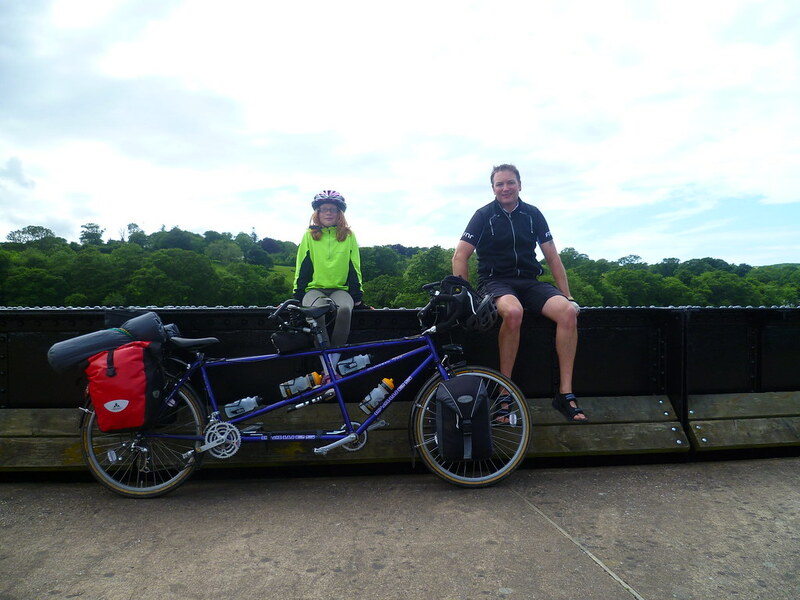 The second tour my Daughter and I have done together. Our next kit up-grade will be sleeping matts which stow more compactly. That is cool . Reasonably small mats definitely help for tandem camping . RANS V2 Formula 26 at Niagara Falls. Up top is an Inertia seat bag and underneath, a Terracycle rack hanging my old Edinburgh universal panniers that were being scraped to pieces on every tight corner, thus ruining my careful pre-tour sewing and mending session. They very nearly didn't make it through the ride, so when I was home, I replaced them with Arkel RT-40s. LHR Terminal 5, en route to the Tuscany-Corsica-Sardinia tour. Arcu Correboi, Sardinia. That's the SS125, Orientale Sarda in the background. The new highway goes through a tunnel here. I took the old road up and over the pass. The bike: Nitto Campee steel front and rear carriers, TA Zephyr triple crank (22-34-46), 8 speed cassette (12-32), friction shifting, downtube shifters, Brooks Swift saddle under the rain cover, SON hub, Schmidt e-delux headlight, Cane Creek direct pull (V-brake) front brake, Shimano cantilever rear brake, Schwalbe Marathon Supremes (26x1.5), Crank Bros. eggbeater pedals. I used to share Charlotte's feelings about having a place to put extra stuff on the front of the bike, now I'm starting to think about saving weight with just a low rider rack in front. I built both wheels myself a few years back for my Sicily tour, they're still performing beautifully. Baggage: Ortlieb bar bag (smallest one), Ortlieb panniers (roll-top in front, conventional closure in back), Rivendell "Keven's bag" under the saddle. 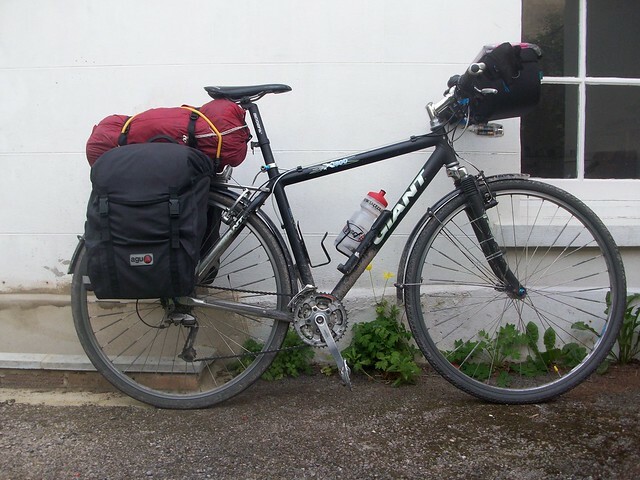 I used to bring the Ortlieb adaptor to turn one pannier into a backpack. This time I brought a lightweight day pack that weighs less and takes up less space than the Ortlieb adaptor, and is a better backpack. Ready to go camping in Slimbridge.